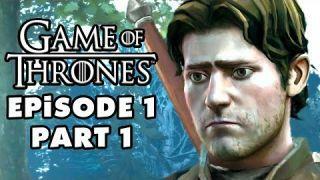 Game of Thrones Episode 1: Iron from Ice Gameplay Walkthrough Part 1! Thanks for every Like and Favorite on Game of Thrones: A Telltale Games Series! Thanks for watching my Game of Thrones Gameplay and Walkthrough by Telltale Games! I'm playing this game on the PC, but it's also available for the Xbox One, PS4, iOS, and other platforms! You may have seen a trailer or review, but this playthrough will feature everything including the ending! If you're a fan of the Game of Thrones series or anything made by the wonderful Telltale Games, then let's play Game of Thrones! Subscribe to ZackScottGames for new episodes of Game of Thrones today!